This Veterans Day join us for Soldier Stories, a benefit concert for veterans' health care projects produced by vocalist Nell Robinson in collaboration with the Coming Home Project. Tonight’s evening of americana and string band music relates the stories of soldiers from before the American Revolution to the current day. The performance features guest appearances by musician veterans, as well as personal stories and readings from soldiers' historical letters. Nell comes from a long line of veterans stretching back to the Revolutionary and Civil wars. She is joined tonight by singer/songwriter and champion flat-picking guitar player Jim Nunally and 2010 Grammy nominee Keith Little (mandolin, fiddle, and vocals), both of whom worked on her recently released album, On the Brooklyn Road. 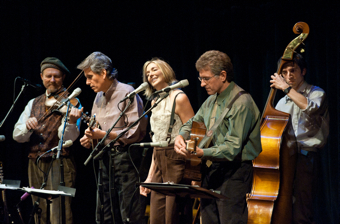 The Soldier Stories band also includes Joe Craven (fiddle, mandolin, and unique percussion) and the impeccable Chuck Ervin on string bass. Come enjoy this opportunity to share an evening of engaging string band music, thank our veterans, and reflect on our history with war and service, while helping to support organizations like the Coming Home Project, a non-profit devoted to providing expert, compassionate care, support, education, and stress management tools for Iraq and Afghanistan veterans, service members, and their families. The Soldier Stories show goes on to tour the East Coast and Southeast, including a stop at the Kennedy Center for Performing Arts, later this Fall.